Earlier this month, the DLSU Dragon Boat team and the DLSU Tankers participated in the coastal clean-up held at the Las Piñas-Parañaque Critical Habitat and Ecotourism Area (LPPCHEA). The teams from Taft took the bus provided by the school to visit the LPPCHEA and to contribute to helping the environment. More popularly known as the Freedom Islands, the same area was once covered in meter-thick garbage when volunteers from the Wild Bird Club of the Philippines and the Save Freedom Island Movement discovered it. Just like the shorelines of Manila Bay, the LPPCHEA is continuously threatened by garbage and pollution. The area similarly faces great threats of land reclamation projects. The group of Lasallian athletes ventured to Las Piñas to take part in the continuous work of the various organizations that have been taking care of the Freedom Islands. “It’s really something close to my heart, and I’m glad that my teammates will get to experience this. I really hope we get to do this often,” graduating Green Tanker Red Silvestre expressed. DLSU Dragon Boat team captain Jiggy Taccad shared the same sentiment with Silvestre. “I’m thankful that in our own little ways, makakatulong kami to help preserve our environment,” Taccad elaborated. After arriving and settling down, the two Taft-based squads formed into small groups and discussed their game plan for the day. Members from the DLSU Tankers and the Dragon Boat team both pitched in ideas on how they could efficiently clean the shorelines and the waters itself. As the two seniors of the teams, Silvestre and Taccad pondered on how they would best utilize their existing manpower and abilities while working together. Since both of the teams have members who have excellent strength and endurance, it was no doubt that their best tool to helping the environment would be their bodies. A member from the Dragon Boat team suggested, “What if we use the Tankers as our paddles for rowing the trash?” To which the two seniors excitedly expressed approval, “That’s a great idea!” With that, everyone enthusiastically headed toward the boats waiting by the shore. In their respective groupings, the Lasallians started riding their boats with their assigned swimmers next to them on their seats. The swimmers wore their goggles and swimming caps and prepared before the members from the Dragon Boat team hoisted and submerged them into the water. The swimmers effectively used their strong pulling power to push the trash to one area, from which the Dragon Boat team can easily collect and dispose of the garbage in the trash bags. The other Tankers decided to swim on their own as they thought it was easier to collect trash via butterfly, breaststroke, and backstroke pulling methods. Once the shoreline and the nearby waters have been significantly cleared of garbage, Taccad explained that his team had a great time with the DLSU Tankers. “Who would’ve thought that it would work and that we could actually work hand in hand like this?” The senior of the team assumed that they would all be holding garbage bags and picking up trash by the shoreline, but they never thought the swimmers would be game for the proposal. Lady Tanker team captain Ace Agustin concluded saying that what urged them to agree was the determination and grit she saw from the two teams. 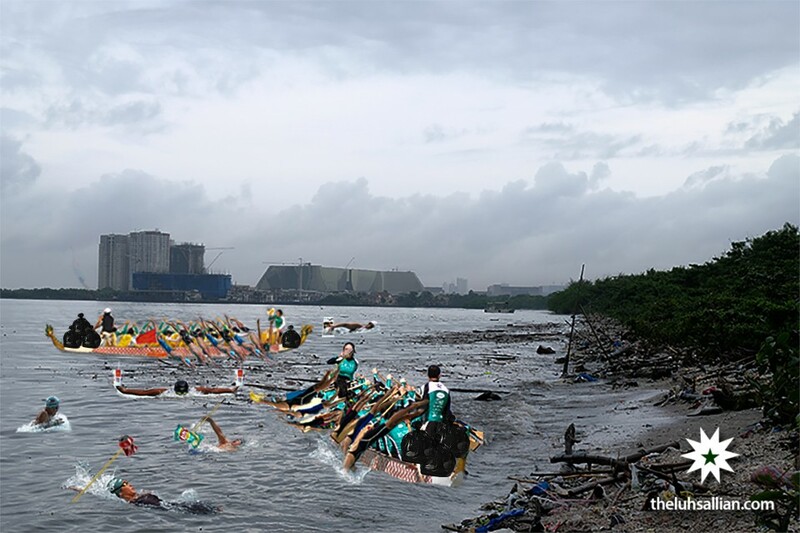 As the DLSU Dragon Boat team and the swimming team joined forces to support the LPPCHEA coastal clean up, she can imagine them exerting the same effort to rehabilitate Manila Bay. “Maybe next time you’ll see the same group helping out in the Manila Bay! We’d love to swim and help clean up over there too,” she affirmed. Taccad mentioned that the bond they formed from the coastal clean up was like no other; they were one as two teams and they were united as Lasallians, true achievers for God and for country. At the end of the coastal clean up, the two teams were more than thankful for the opportunity to help the environment. They were also grateful for the once in a lifetime experience to uniquely collaborate with one another. “We were doing so well today, sana they would be ‘g’ to be our paddles during actual competitions,” joked the team captain.